'San is about as far as it's possible to be from the "Disney Princess" archetype Western audiences are raised on and have come to expect in animated cinema, but then that's probably no surprise to Ghibli aficionados'. Whilst Miyazaki's subsequent feature, Spirited Away, is often credited as being the release that successfully brought Studio Ghibli to mainstream Western audiences, Princess Mononoke was in fact the first Ghibli film to receive major attention from a US distributor. Miramax spent a huge amount of time and money putting together a big name voice cast (including the likes of Claire Danes, Gillian Anderson and Billy Bob Thornton) for an English language dubbed release of the film. However, the company fluffed matters at the final hurdle, securing only a short run in a limited number of cinemas and making Princess Mononoke a box office flop in America. It seems to me that Miramax got things the wrong way round. Had they focused their efforts on getting the original Japanese language film into as many cinemas as possible for as long as possible, this would undoubtedly have been Ghibli's first smash hit in the West; all you have to do to convince anyone of Princess Mononoke's brilliance is simply to show them Miyazaki's film. From the outset, Princess Mononoke is a wondrous, exciting and beautiful film to behold. The opening scene, in which protagonist Ashitaka (Yōji Matsuda) battles a cursed giant boar-god that intends to attack his village, introduces both the film's superbly choreographed action and the first taste of Miyazaki's intricately woven mythology very early on. The director is confident in making the conflict within Princess Mononoke satisfyingly intense, at times including stylish manga-influenced touches to give his film a more adult-oriented edge. Miyazaki also slowly and expertly dripfeeds the mythos of his film to the audience, ensuring that each element is properly introduced and makes sense individually, whilst also weaving from the many strands an intricate, intelligent tapestry of Japanese lore. Whether human, animal or supernatural, the cast of characters assembled within Princess Mononoke are resplendent with personality, depth and creative flair. 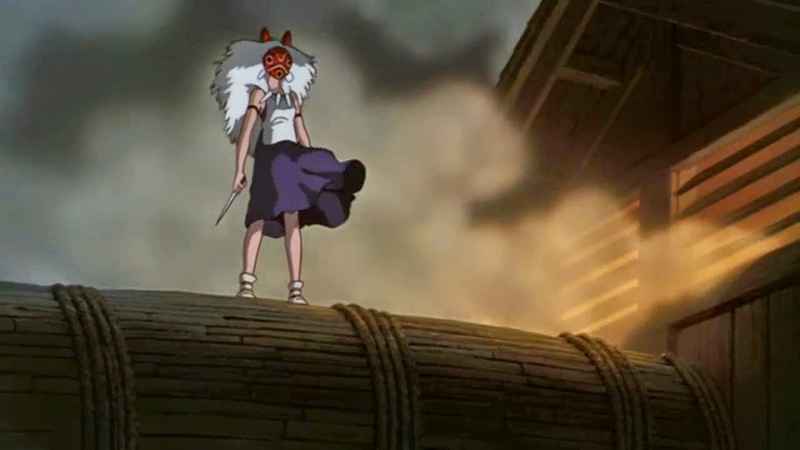 San (Yuriko Ishida), the titular princess ("Mononoke" being an adjective - translated as "spectral" - rather than a name), is about as far as it's possible to be from the "Disney Princess" archetype Western audiences are raised on and have come to expect in animated cinema, but then that's probably no surprise to Ghibli aficionados. If Ashitaka is the hero of the story, then San is arguably an antihero, although her character doesn't fit easily into a predefined role. The same can be said for San's nemesis, Lady Eboshi (Yūko Tanaka), who possesses the power-hungry trait of a classic villain, but also clearly cares a great deal for the people of the Ironworks, the settlement over which she rules. It's this complexity within Miyazaki's characters that truly makes Princess Mononoke a story of sublime richness and authenticity. Whilst there are several themes layered within Miyazaki's film, the most powerful message the director puts across is that of the dire consequences of the destruction of nature by man. It's a warning which in less skilled hands could easily have become sanctimonious and moralising; related by an expert storyteller such as Miyazaki, however, this never becomes preachy, remaining heartfelt and frank throughout. Miyazaki's clear respect for nature and animals is consistently evident and powerfully infectious. Ultimately, whether you view it as either a complex fable or an epic fantasy adventure, Princess Mononoke is simply a brilliant story told flawlessly from start to finish.